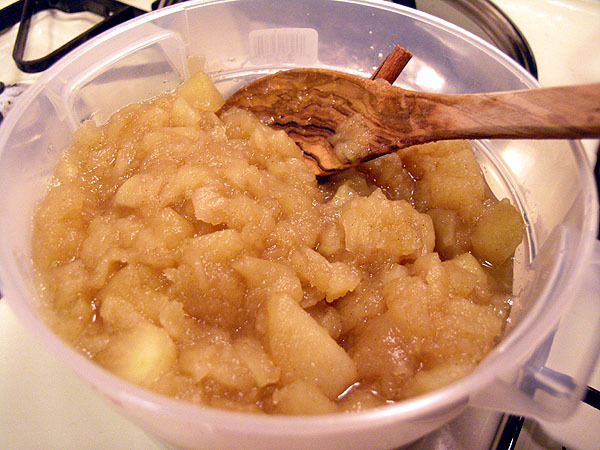 Applesauce is OK. Homemade applesauce with brandy, vanilla bean and cinnamon stick is way, way better. This stuff is like eating apple pie filling. Maybe add some pastry crust for a mock apple pie? I like mine chunky, so I just use a potato masher. But if you like it smooth, use a stick blender. This is based off a recipe I found in the Milwaukee Journal Sentinel a few years ago. 1. Peel, core and roughly chop your apples. 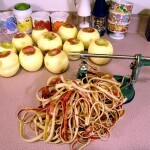 If you have one of those apple peeler/corer/slicer things, now’s the time to use it. Just take off the little corer/slicer thingy so it just peels them. You’ll end up with apple skin garland! 2. Split the vanilla bean and scrape the seeds out. Throw the seeds, the pod and everything else into the pot and bring to a simmer. Simmer for 10 minutes, stirring every couple minutes, making sure to smoosh the cinnamon and vanilla bean into the liquid. 3. The apples are done when they’re still holding their shape. Mash with a potato masher or stick blender. 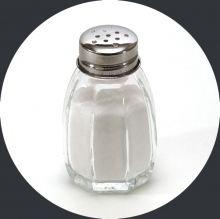 If you’re worried about the sauce being too thin or watery, reserve some of the liquid and add it back in as necessary as you mash. Chill if you like, but this sauce is great warm or at room temperature as well!